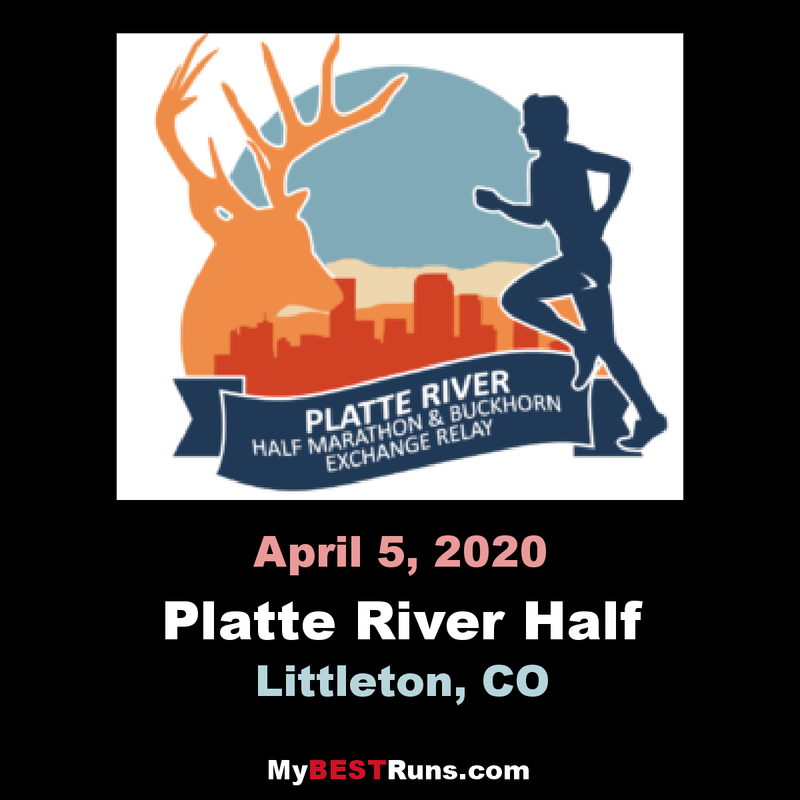 The Platte River Half-Marathon and Buckhorn Exchange Relay, proceeds go towards the Leukemia and Lymphoma Society. 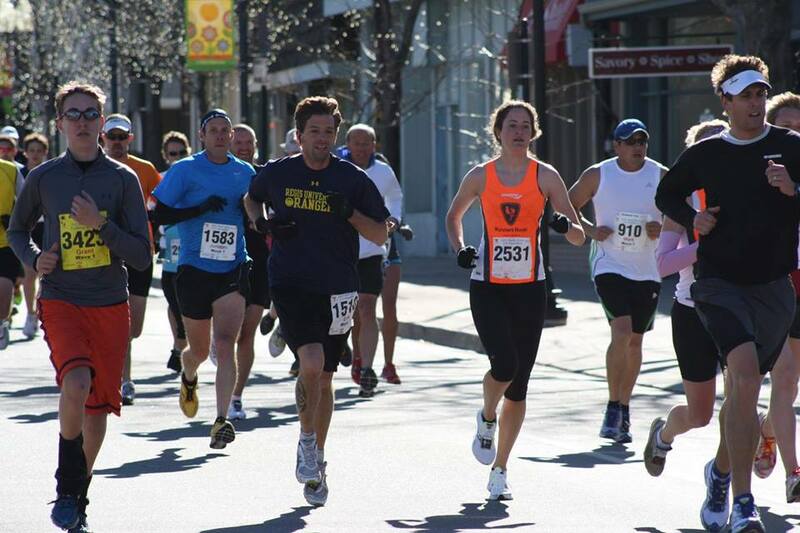 This point to point course is certified by USATF and was recognized as Competitor Magazine’s Best Half-Marathon and Post-Race Party in 2012 and Colorado Runner Magazine’s Best Half-Marathon in 2009 and Best Post-Race Party in 2011. Come run and see why. The race will begin at the intersection of Alamo Ave. and Prince Streets next to the Downtown Littleton Light Rail Station and run through the streets of Littleton before joining the Platte River Trail to run 10 miles downstream to Denver. The course will leave the trail for the final 1.1 miles at 8th Avenue and head east over the 8th Avenue Viaduct to the finish at the Buckhorn Exchange at 10th Avenue and Osage Street. There is an approximate net elevation drop of 120 feet with only one uphill section on the course from 12 to 12 ½ miles as you cross the 8th Avenue Viaduct. The surface throughout the race is asphalt and concrete with over 50% of the trail adjacent to the course consisting of dirt and crushed gravel. Along with a fast course each participant will receive a long sleeve technical shirt with this year’s race logo and a finishers medal. This year’s expanded post-race meal will be provided to all race participants and includes hamburgers, breakfast burritos, rice and beans, chili, potato chips, pickles, fruit, cookies, ice cream, beer and various other drinks. Live music will be provided at the post-race party. After your race and lunch you will be provided a ticket on the RTD Light Rail for return transportation to the Downtown Littleton Station. The Light Rail Station at 10th Avenue and Osage Street is just steps away from the finish line and post-race party. The relay will consist of three legs of 5 miles, 5 miles and 3.1 miles. The first exchange point is at the Englewood Golf Course just north of Oxford Ave. Take Santa Fe Drive north to Oxford Avenue. Go west on Oxford Avenue. Utilize the parking lot on the north side of Oxford Avenue on the west side of the Platte River. 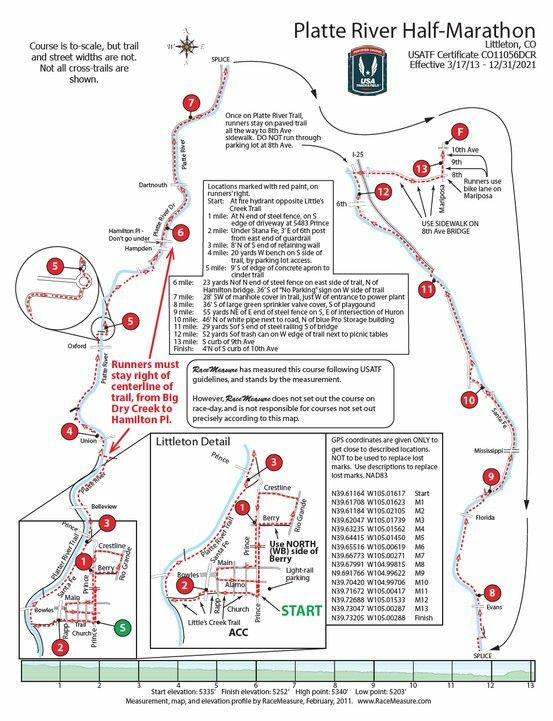 A volunteer will direct the 2nd runner to the 5-mile marker, which is a just north of the roundabout on the east side of the Platte River. Overflow parking is in the golf course parking lot, far west side by the bathrooms. The second exchange point is located near Vanderbilt Park in Denver. Take Santa Fe Drive north to Alameda Avenue. Go west on Alameda, crossing I-25. Turn left onto South Platte River Drive. South Platte River Drive will turn into Jason Street. Follow Jason Street south until you reach Exposition Avenue. Go East on Exposition Ave. to where it intersects with Huron St. There will be an aid station at this intersection. Parking on the street nearby is your best bet. The actual exchange zone is just north of where runners go under Santa Fe on the bike path. Each mile will be marked, courtesy of our Mile Marker Sponsors. Split times will be the responsibility of each runner. For safety reasons we ask you to refrain from running with dogs andbaby joggers/strollers during the race. The Platte River Trail is a multi-use trail and will be open to other exercise enthusiasts during the race. Please be respectful of their use of the trail. Transportation to and from exchange points is the responsibility of the relay teams. One vehicle/team should be sufficient.